Emperor Monmu (文武天皇, Monmu-tennō, 683–707) was the 42nd emperor of Japan, according to the traditional order of succession. Monmu's reign spanned the years from 697 through 707. Before his ascension to the Chrysanthemum Throne, his personal name (imina) was Karu-shinnō. He was a grandson of Emperor Tenmu and Empress Jitō. He was the second son of Prince Kusakabe. Monmu's mother was Princess Abe, a daughter of Emperor Tenji. Monmu's mother would later accede to the throne herself, and she would be known as Empress Gemmei. Karu-shinnō was only six years old when his father, Crown Prince Kusakabe, died. 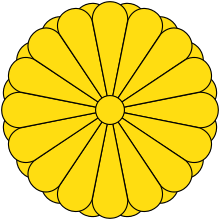 697: In the 10th year of Jitō-tennō 's reign (持統天皇十年), the empress abdicated; and the succession (senso) was received by a grandson of Emperor Temmu. Shortly thereafter, Emperor Monmu is said to have acceded to the throne (sokui). Emperor Monmu ruled until his death in 707, at which point he was succeeded by his mother, Empress Gemmei, who was also his first cousin once removed and his first cousin twice removed. He left a young son by Fujiwara no Miyako, a daughter of Fujiwara no Fuhito: Obito no miko (Prince Obito), who eventually became Emperor Shōmu. Emperor Monmu's reign lasted 10 years. He died at the age of 25. The actual site of Monmu's grave is known. This emperor is traditionally venerated at a memorial Shinto shrine (misasagi) at Nara. The Imperial Household Agency designates this location as Monmu's mausoleum. It is formally named Hinokuma no Ako no oka no e no misasagi. Conventional modern scholarship seems to have determined that the years of Monmu's reign are encompassed within more than one era name or nengō. The initial years of Monmu's reign are not linked by scholars to any era or nengō. The Taika era innovation of naming time periods – nengō – languished until Monmu reasserted an imperial right by proclaiming the commencement of Taihō in 701. See Japanese era name – "Non-nengo periods"
"The eras that fell in this reign were: (1) the remaining seven years of Shuchō [(686+7=692? )]; and (2) Taika, which was four years long [695–698]. (The first year of this era was kinoto-hitsuji .) ...In the third year of the Taka era , Empress Jitō yielded the throne to the Crown Prince." 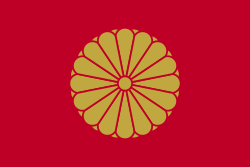 1 2 Imperial Household Agency (Kunaichō): 文武天皇 (42); retrieved 2013-8-22. ↑ Titsingh, Isaac. (1834). Annales des empereurs du Japon, pp. 60–63, p. 63, at Google BooksBrown, Delmer M. (1979). Gukanshō, pp. 270–271; Varley, H. Paul. (1980). Jinnō Shōtōki. pp. 137–140. ↑ Brown, pp. 264; prior to Emperor Jomei, the personal names of the emperors were very long and people did not generally use them. The number of characters in each name diminished after Jomei's reign. 1 2 3 Brown, p. 270.